Mobile penetration continues to grow worldwide, and Mobile Marketing opportunities are expanding at a steady pace. India is the fastest growing base of mobile subscribers in the world! 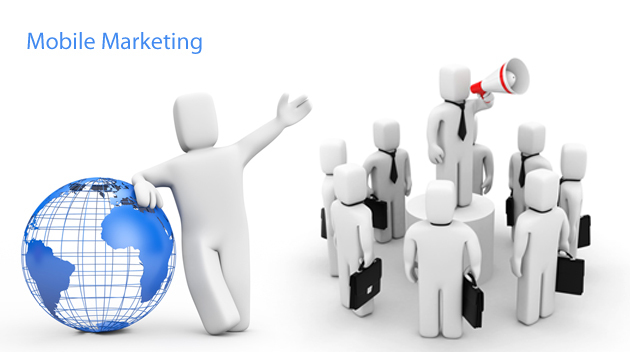 The potential for Mobile Marketing therefore, is one that several marketers are well aware of. The advantage of Mobile Marketing is that it gives clients one-on-one direct access to customers and potential customers, is targeted, viral, allows for personal contact and is cost effective. Mobile campaigns by MMS, SMS or WAP push. Mobile newsletter by MMS, SMS or WAP push–link to a special newsletter landing page. Mobile marketing platform with campaign management, dispatch, archiving and statistics. Advertising module with banner rotation for advertising banners in existing mobiles. With our extensive experience of providing Mobile Marketing to a large number of companies, we help our clients get the most out of a marketing strategy. We have come up with fine tuned methods of profiling potential customers and helping them see value in our clients' brands. Whether it is SMS contests, customized SMSes or even Bluetooth engagements, you can rely on us for a well thought through and strategic Mobile Marketing solution. Partner with i2i Telesource for a solution that will work for you. Operators seeking alternative revenue source closest to their core competence for expanding the mobile service revenue, by driving greater data usage! To expand the revenue sources for including non-telecom products and mobile advertising is the key element. To provide a single user-friendly platform that both advertisers and publishers (WAP/WEB-site owners) will benefit from. 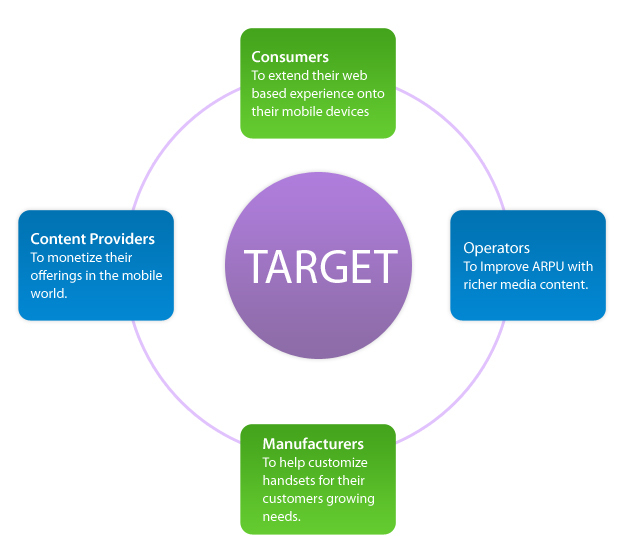 To target contextual, region, device and platform specific advertisements to viewers of the site. To provide features like one click redirection to another site or to a custom landing page created by iMMP with Ad Details like images, text, video, audio, along with ability to send SMS, Email, etc. in addition to features like Click-2-Call and Click-2-Add-Contact. To provide on-the-fly trans-coding of banner images for varying screen sizes of handsets. To provide Dynamic pricing for Ads on user’s target selection. Ads Targeting based on: - Continents & Countries, Carrier, channel, manufacturer etc. We’ll help you to carry out your mobile campaigns and provide customized advertising space in mobile services, mobile Internet pages and applications. We can enhance your advertising platform, by providing prompt modification of banners and reliable CMS and billing systems. If you’re operating a mobile portal, then mobile advertising is an ideal instrument for recouping costs. Just contact us! i2i's ODP framework enables media companies and service providers to rapidly deploy and manage rich media mobile applications that deliver an enhanced user experience. i2i's ODP framework embeds mobile advertising, wide handset support and management capabilities that increase profitability, lower cost of ownership and drive brand-awareness. i2i Telesource ODP is a next-gen portal (Text / Graphic) for mobile audience beyond SMS, STK and WAP standards. Its superior user experience and advanced personalization makes it a premier platform for delivering content and services to the mobile device users. The services offered by ODP are not restricted to portal information services and extend to services such as contests, music, infotainment and handset customization. The ODP server keeps the subscription information and maintains the customer profile for every request on application, content and service the subscriber has made. The ODP server interfaces with the CMS advertisement platform to render advertisements when the application goes in idle state. The idle state is configurable in the ODP client. i2i Telesource Phone Back-Up solution secures consumer's mobile contacts and content on the service provider's network. With simple over-the-air setup and operation, there is no need to physically connect to a PC, and consumers have the option of tailoring the content and timing of back-ups. Content and contacts can be restored quickly and easily by downloading the data from the web or desktop to the mobile handset. Backup & Restore:- The most comprehensive ‘over the air’ mobile backup and restore solution, capable of protecting and storing any kind of data – from text and video to business applications. Mobile back up is built on robust, flexible and scalable technology. A client/server platform based on open standards, which is simple and straight forward for operators and service providers to implement through a web services layer that integrates with enterprise IT infrastructure. Provide device clients for Symbian S60/S80/UIQ, J2ME, BREW and Windows Mobile Smart phone/Pocket PC, which can be installed either via download or pre-installed in the devices. Supported by strong growing network of partners which includes Ericsson, Gemalto, Hewlett-Packard, m Formation, Motorola, and Nokia. Push Mail removes barriers that have prevented mobile email from being widely adopted by the consumer market. Push delivery and a desktop-like experience let subscribers immediately view, send and respond to their email — anywhere, anytime and from any device. It utilizes a mail delivery system with real time capability to “push” email through to the client as soon as it arrives, rather than requiring the client to poll and collect or pull mail manually. Read, manage and reply to the mobile email Pushes email to the phones. Push Mail gives all mobile subscribers, regardless of handset or network, access to email, via custom client, or email client. Users can receive messages in real-time from all of their email accounts (ISP, Web-based, ISP-hosted business, and Operator accounts) directly to their handset, much like an SMS. The simple, intuitive user interface with immediate access to messages, and attracts subscribers to encourages usage. Easy and seamless integration across media and across messaging services enables mobile operators to capitalize on the popularity of email from the Internet world. This increases mobile data traffic and revenue, and enhances subscriber loyalty. Push Mail is based on a scalable, powerful and flexible mobile synchronization server. Unstructured Supplementary Services Data (USSD) is a service which significantly accelerates the interactive communication between mobile phone users and various applications within the GSM network. Almost 90 per cent of the worldwide GSM infrastructure and almost 100 per cent of all available mobile phones support the transfer of USSD messages via the MAP protocol. Our attractive USSD solutions will help you discover new business opportunities in this field. At i2i your WAP platform is in safe hands. You can trust i2i for extensive management of your mobile portal. On request, our in-house team of editors can provide ideal content specifically for target groups, prepare content for all standard mobile phones, guarantee a 24-hour update service, take over the billing process and customize your platform just as you like.